John Isner came through a hard-fought last-16 Stockholm Open tie against Bradley Klahn to keep his ATP Finals bid on track. 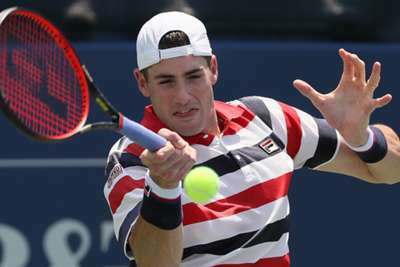 American Isner, the top seed in Sweden, is 10th in the Race to London standings but further closed the gap on the top eight with a victory on Thursday, although he required three sets, all of which went to tie-breaks. A 7-6 (7-2) 6-7 (5-7) 7-6 (7-5) win was eventually sealed after both Isner and his compatriot Klahn dominated on serve in a tense clash. Second seed Fabio Fognini also progressed, beating Lukas Lacko in straight sets, but Denis Shapovalov was stunned 6-2 6-4 by Ernests Gulbis. Philipp Kohlschreiber came from behind to upset Fernando Verdasco, while Tennys Sandgren also came through three sets to win against Oscar Otte. At the European Open in Antwerp, Jo-Wilfried Tsonga's run came to an end. The Frenchman, who won his first match since injury earlier this week, went down 6-4 3-6 6-4 to friend Gael Monfils. Kyle Edmund raced to a huge 6-0 6-2 triumph over Albert Ramos-Vinolas to book his place in the quarter-finals. There were also wins for Diego Schwartzman and Ilya Ivashka. Nick Kyrgios succumbed to an elbow injury at the Kremlin Cup, retiring ahead of his match with Mirza Basic, but the other seeds enjoyed better days as Daniil Medvedev and Filip Krajinovic cruised through.